We are open today 10am until 4pm, why not come up for a walk in the woods to see the Bluebells and come into the tearoom for Breakfast Baps or Tea and Cakes. Lots of nice things for the BBQ on offer. The great weather on Good Friday brought out lots of visitors. A big group of motorcycling Trail Riders turned up to enjoy the' Wysipig Giant Breakfast Bap'. If you are member of a motorcycle or car club why not drop it and see what's on offer for your group, you can be sure of a friendly welcome. Breakfast can be ordered in advance and will be ready on your arrival alternatively it will be cooked on the shop's traditional Aga while you wait! Why not come up and see what Kevin our great butcher has on offer, joints for Sunday roast or sausages and a range of marinated barbecue meats. We will be serving our signature "Giant Breakfast Bap' as well as tea and wonderful homemade cakes, just wander up and enjoy the tea room and garden. Also on offer this week potatoes by the 25kg bag. The campsite is open for those ready to enjoy an overnight stay! Spring is here, looking for something to do? Wysipig at Ellis’s Hill Farm, Sindlesham Road Arborfield is holding its monthly open day this Saturday 12th April from10 AM to 4 PM and this month is our Easter special. Besides the usual range of delicious pork products the shop now stocks farm reared beef and chicken as well, as a great selection of other artisan foods. For more information about the open days for the coming year visitors can look at the company's website/Blog (Wysipig.net blogger)or check out its Facebook and Twitter pages or call 07774 989362 Early birds will be able to try the new ‘Giant Breakfast Bap’, customers on Saturday will also be able to enjoy the usual hog roast rolls, tea and cakes as well as browse the ‘Gift and Bric a Brac Shop in the Barn’. Wysipig -‘What you see is pig ‘raised with care and very tasty! The company is based on our family farm in the heart of the Coombes woodland on the edge of the village of Arborfield in Berkshire. Pesticides have not been used on our fields within living memory. 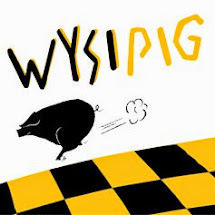 Wysipig is well known for its range of pork products found on sale in the farm shop or at farmers markets around the area. More recently we have started retailing other home and locally reared meat products. Besides our own herds we work with a number of small producers from Berkshire and the neighbouring counties from whom we buying cars for rearing and some pigs are finishing to complement our own stock. The company prides itself on excellent service, care and attention to detail. The French family and their master butcher, Kevin Turner look forward to meeting you. We welcome group visits for breakfast lunch and tea or simply morning coffee and pastries. We are a regular stopping place for parties of Ramblers trail riders and vintage vehicle clubs. If you feel that your group may like to visitors please get in touch to discuss your requirements. We can also arrange various talks on the history of the farm, the area or the vintage vehicles. On the second Saturday of every month we hold an open day on the farm where visitors can see the animals and the vintage vehicles in addition customers are able to purchase hog roast rolls for lunch.